There is no denying we have had to contend with the snow this week – receiving the text from school to collect your children early is enough to fill any parent with dread! 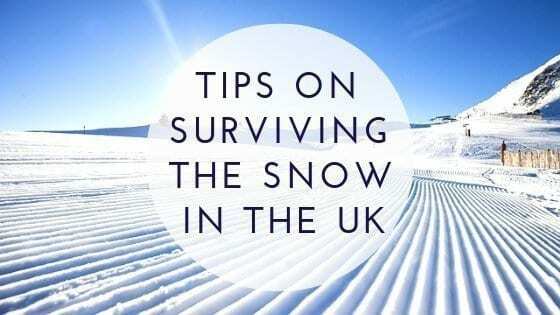 Why the UK is so inept at dealing with an inch or two of snow is beyond me, considering there are many other countries around the world that cease to stop even with several feet of snow to contend with! First off, don’t panic! Chances are we are going to have to deal with some nominal amount of snow each year… this is not a new thing! Just remember that everything is going to take a little longer than usual – such as a normal 30 minute journey could take 2 hours, so always make sure you give yourself plenty of time. This goes without saying, however some still believe they are Formula One drivers even in the snow. Stay clear of these muppets as being near them will increase your chances of a road accident. Roads will be unpredictable, so take your time, keep a distance between other cars on the road and just drive sensibly with the conditions. Even if you are nipping down to the local shop, it is advisable to pack a blanket, some food and drinks, paper and pen and a power bank (extra juice for your phone! ), just in case you do become stranded. This doesn’t mean stockpiling for an apocalypse, just make sure you have enough items such as bread, milk, nappies, medicines etc to last a few days. Weather at this time of year can be unpredictable, but being prepared so that you do not need to embark on unnecessary journeys will aid you and others. If you are unsteady on your feet, or you simply want a snow day, then do not go out unless you need to. Children will no do not want to play in the snow and build snowmen, ensure they are wrapped up warm! You can speed up the process of life getting back to normal by clearing your drive/close/just outside of your house – it’s neighbourly and helps others as well as yourself! If all else fails and you want to keep warm… stay in bed! If you have a TV bed, all the better, you lucky thing! Staying in bed all day long, all snuggly and warm, only getting up when necessary sounds like my idea of heaven! The height of utter luxury and laziness, TV beds would certainly be awesome to cwtch up in when it snows! If last year’s ‘Beast from the East’ taught us anything, it was to insulate any outside pipes connected to boilers! Facebook was awash with threads on boilers not working and pipes being frozen. The main solution being to cover your pipe with a towel and pour moderately hot water from a boiled kettle onto the towel. It may well take several attempts but it does work! To ensure your outside pipes are protected lagging them with insulated foam pipe covers is the way forward! How a Surprise Holiday Lead To An Awesome Craghoppers Purchase!